Black is the colour of mystery, masculinity, power and dominance. Integrate the black colour into the kitchen brings all the drama, secrecy, sophistication and compactness into the kitchen. Black does not mean only midnight black or ink black. The colour comes in various hues ranging from the darkest shades and crossing to hues of gray. High masculinity and boldness can be integrated in the kitchen with darker shades while going to lighter shades will give a softer look to the kitchen area. The black kitchen makes a statement of bold, contemporary and elegance with its conservative and authoritative style. 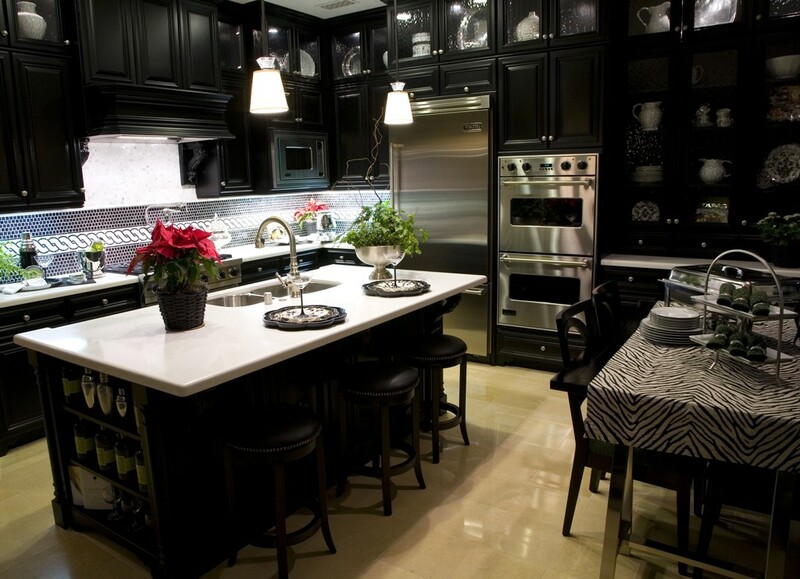 The epic contrast created by the black and white make Black kitchen looks opulent and stunning. The Ying and Yang concept is accentuated by the use of stainless steel elements against a dark backdrop. An entire room decorated in black is not trendy but using black for accenting the interior space with a dash of white here and there, makes the room dramatic and welcoming at the same time. For more animation, a black splash back is used. The black and white mixture creates a look of modern aesthetic design with crisp classic elegance. People often prefer this elegance by offsetting the overpowering combination. Black is used to give discipline, authority and masculinity to the kitchen while white is used for a reflective, open, feminine soft touch. The black kitchen displays some features a black island which is highlighted by white furniture, white walls and white bench-tops. To make a formal yet casual look, a black chandelier is hung over the black island. With simple geometric designs, a playful edge is created into the kitchen. The black floor and the black window panes add sophistication to the room while white cabinets give an open feeling to the kitchen. Homeowners prefer stainless steel appliances with this design since they compliment the stunning black backdrop of the floor, bench top and windowpanes. Black is used to its maximum advantage by disguising some features of the kitchen which stand out and do not go well with the entire look. The reflective sharp surfaces of the stainless steel can be used for the appliances, bar stools, light fittings and the splash back with glossy floor and visually motivating black kitchen. Some homeowners do not prefer black cabinets since they can give an enclosed feeling to the kitchen. Instead, they prefer a black splash back which can be textured or glossy. The dark splash back is representative of wholeness, sophistication and power without any arrogance or dominance. While white is a reflecting colour, black is an absorbing colour. A room can feel enclosed and small. It is also hard to maintain black kitchens, since even a little dust, starts showing on the glossy black surfaces and scratches show starkly. Thus, one can create a contemporary, modern or an opulent look with black kitchens Brisbane.